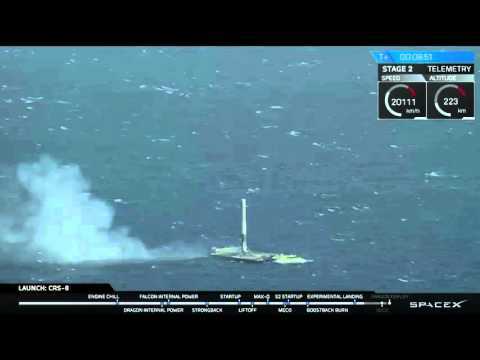 Well, spaceX has finally pulled it off -- they've vertically landed a stage 1 booster rocket. https://youtube.com/watch?v=ZCBE8ocOkAQ. I was watching it while cooking meatballs. It was an amazing 45 min show. I'm tempted to show it in class. Actually this was really awesome. And now it's landed at sea on a tiny little barge!!! Dang, what are those guys going to do next? Land one in the palm of Elon Musks's hand? ...tho that would be neat haha! "Elon Musk hospitalized with severe burns on left hand; vows next version of rocket booster will be able to safely land without the use of rocket motors".